This is only a symbolic victory, though. Hope there's no repercussions seeing as the anniversary of 9/11 is coming up. There's just going to be another nutter leading them all now. I believe Bin Laden is now in hell. I hope he is enjoying the hottest shelf. ... or otherwise bashing away at his 72 virgins in "Paradise". All Obama has to do is tell everyone it was his decision to look at Pakistan to take away any credit the Republicans try claim. As someone who lived in a town where everyone worked in NYC and on that horrible day I had friends, teachers, and classmates that lost people. So to wake up and hear that Bin laden is dead is 10 years late but worth savoring. And the fact it was a fellow American that put a bullet in him is satisfying. Voldemort was killed on the 2nd of May too! Anyone else got Highway to Hell stuck in their head? That's not actually foxnews channel that you come to know and love. And I can believe that actually happening too. Most likely a altered pic though. Fuker already hard at PhotoShop work ha. Airports are going to be a ****ing paranoid nightmare again, aren't they? I don't think I approve of all this celebration of death, even when the man concerned was - by most accounts - a scoundrel. what the **** do you expect?? people blame him for the murder of 1000s of people. of course they're happy! they feel justice has been served. get off your high horse. Good. Would rather have seen the man on trial. Its a symbolic victory but these can be the most important. The longer he hid the more of a shock it would be when he finally got killed. 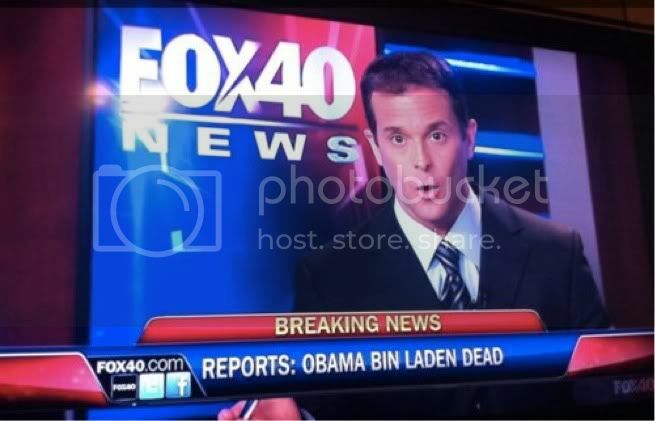 So Osama bin Laden had finally been killed. They must've found him using his Playstation Network details.